My posts have been slim this week. Normally I post once a day, but between family obligations and sick kids I have had no time for my blog. Right now my youngest is miserable on my lap while I attempt to write something that is at least semi intelligible. Whenever I am sick with a cold I love spicy food, the spicier the better. Especially when I have a stuffy nose I love things that have lots of flavor and kick. One of my favorite types of food to make spicy is Indian cuisine. The flavors can be made mild or intense and many recipes are easy to make at home. Last week I tried a new recipe for Cilantro Lentils with Lemon-Cumin Rice from the March 2013 issue of the Food Network Magazine. This recipe has 10 ingredients in the lentils and 6 in the rice. The lentils take 1 hour of total time, 15 minutes of which is active and makes 6 servings. The rice takes 45 minutes, 5 minutes of which is active and makes 6 servings. I had no problems finding any of the ingredients. I did make a few changes. Instead of butter in the lentils I used canola oil and I increased the cayenne pepper to 1/2 teaspoon. Additionally, I let my lentils cook longer than the recipe suggested. I increased the total time by approximately 1/2 hour. This increased cooking time allowed the lentils to fully thicken. Make sure to salt again before serving, I needed to add an additional 1/2 tsp of salt. The lemon juice added at the end of the lentil recipe makes all the difference. It really does add a great flavor that finishes the dish. 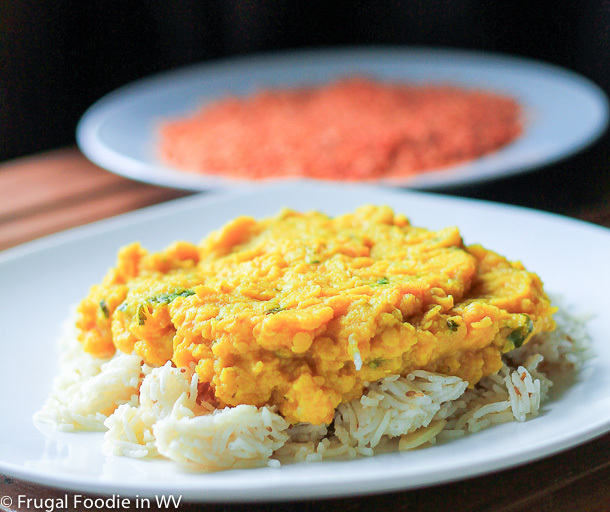 The lentils and the savory rice are delicious together. The tastes play off of each other and are perfect. The rice would also work well with other recipes and could be modified to be more or less savory. For the recipes go to Cilantro Lentils and Lemon-Cumin Rice. What a good idea for a recipe! I've been loving spicy food lately. This looks comforting too. I love spicy foods too :) It is definitely comforting also! loving this dish! I love spicy food too when I'm sick! Found you at Sensational creations' blog hop! I'm going to follow you through GFC! I think you are big fan of Asian Food..This is my utmost favourite.. I love Asian food, it's yummy! Ooooh, I love lentils! This sounds really good and would make a nice addition to the roasted chicken I make on occasion. I hate getting dental work done, I hope you feel better soon! So sorry everyone is ill in your family. I hope they all get better soon. This recipe looks really good. I will have to try it when my daughter is home on spring break. Thanks, they are feeling a little better tonight :) If you try the recipe tell me how it turns out! I'm definitely going to have to try this. It really sounds good, and I like that you lightened it up a bit by cutting out the butter. I try to avoid butter when I can, the substitute worked well in this recipe. This sounds so wonderful. It sounds perfect to warm up a cold day. Thanks :) It is nice to eat spicy foods when it is cold outside! Hi! This looks so yummy and comforting. Plus I can make this gluten-free for my sis. Thanks for giving me a great dish to cook this weekend. I found you via the Harvest of Friends Blog Hop. I'm following. I eat gluten free also :) If you end up trying it tell me how it turns out! Hi, visiting from the blog hop. Boy, could I use this right new! I am at work and getting ready to eat pnut butter and a banana. I love lentils and rice. Have to give this a try. Very nice blog.I am your new follower, on NB and checking to see if you have FB. Nice meeting you. Peanut butter and a banana sound yummy to me, I love fruit and peanut butter as a snack :) Followed you back!